The Vamp Kids are terrorizing South Park in this DLC with a new story expansion. You'll be able to take them out this month. Looks like you'll be goin' back to South Park and having yourself a time with the announcement of the second DLC content drop for South Park: The Fractured But Whole. It's called "From Dusk Till Casa Bonita," obviously a play on the vampire-centric From Dusk Till Dawn film. Mysterion's sister (Kenny's sister Karen McCormick, actually) has started hanging out with the wrong crowd. It's bad, too. It's those pesky Vamp Kids. Kenny obviously can't have his precious sister Karen mixing with those deviants, so he takes up his Mysterion identity to help bring Karen back over to the "light side," if you will. To help him, you and the rest of the South Park gang will have to suit up as your superhero identities and head to Cartman's favorite restaurant, Casa Bonita, to kick things off. Your journey will take you to Black Bart's Cave, where you'll mingle with cliff divers, taste some Mexican culinary decadence, and most importantly defeat those Vamp Kids once and for all. Playing some sunny pop music might help. You can adopt an entirely new superhero class to make the fight a little fairer, though. The Netherborn class comes with four occult-themed abilities and goth costumes to make sure you look the part, too. But you'll also need the help of someone who's in touch with her inner dark side to make sure you show the Vamp Kids what for, and for that you'll have goth chick Henrietta by your side. Her witchy powers will level the playing field, so you can get Karen back for Kenny in no time. 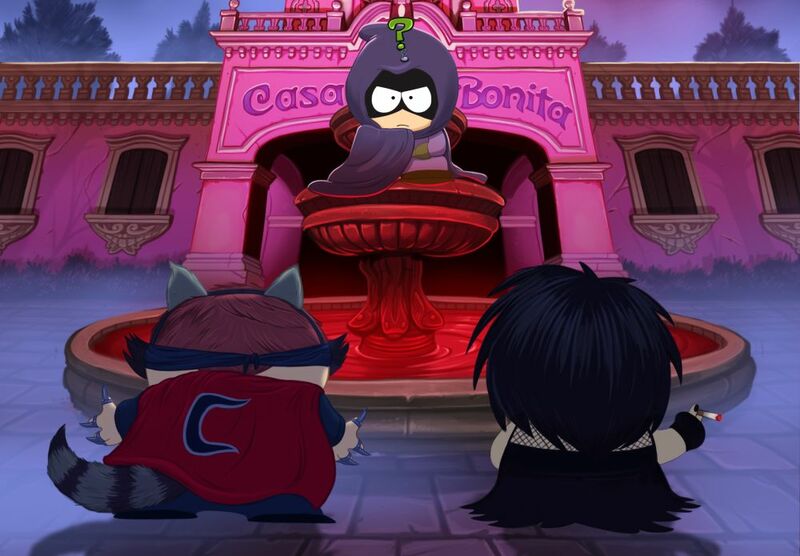 "From Dusk Till Casa Bonita" is launching for PlayStation 4, Xbox One, and PC for South Park: The Fractured But Whole owners on March 20. Better bust out that black lipstick and nail polish now. Why can't they put this game on Switch? Seems perfect for it.